With children going free at The Greenbank this half term, we’ve put together a collection of fun and educational ready-made adventures for those visiting our wonderful harbour town of Falmouth. The Gylly Rock Pool Ramble: At low tide all sorts of sea creatures can be spotted in the rock pools of Gyllyngvase beach. Rockpools + kids = hours of fun and precious quiet time for mum and dad to enjoy a cuppa. Get Nautical: For a real nautical adventure, climb the 100ft lookout tower at The National Maritime Museum Cornwall. NMMC’s hands on activities and awesome exhibitions mean hours of fun whilst learning new things. They’ve got entertaining small ones spot on! Time Travel Adventure: Take a trip to Pendennis Castle and step back in time in this mighty fortress. Fire cannons and be a soldier for the day whilst enjoying the intriguing exhibits and activities for tiny hands. Jungle Trek: Take a jungle trek through Trebah Gardens; the 25-acre sub-tropical site offers a natural playground for any little adventurer. Enter Tarzan’s camp, ride the paraglide or take the children’s trail through the greenery. Run in the Wild: Kimberly Park is the perfect spot for running off any excess energy! Seven acres of open spaces, trees to hide behind and beautiful displays of ornamental flowers make it perfect for the entire family. Strike Lucky: For a rainy day why not take a trip to Ocean Bowl for a skittles competition. It’s great fun for all the family, especially competitive dads! Underwater Adventures: When it’s too cold to take a dip in the ocean, Falmouth’s Ships and Castles offer the next best thing! Every 20 minutes wannabe mermaids, pirates and sailors brace themselves for the super fun river rapids and wave machine! Skimming Competition: Swanpool beach offers the perfect place for a stone skimming competition. Will it be one, two or three bounces? Compete to take the (unofficial) title of Falmouth’s champion skimmer! The Big Screen: The Phoenix Cinema is easily within walking distance of The Greenbank Hotel. Situated on The Moor, it’s perfect for an evening munching popcorn and watching the latest blockbuster. The ‘5 Minutes of Peace’ Adventure: Fancy a quiet moment? 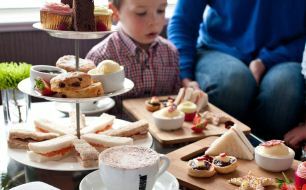 We make the most heavenly and tasty children’s afternoon tea. It’s proven to keep little ones quiet for 5 minutes…and with games and a chalkboard in the lounge, a quiet 5 may turn into a blissful 50! Call +44 (0) 1326 312440 or contact reception@greenbank-hotel.co.uk to book your stay at The Greenbank today.